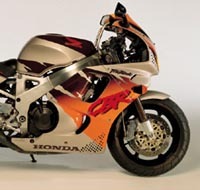 If you ride a CBR900RR or a VTR1000, are you disappointed that most other Japanese Supersports bikes have 6 piston Calipers and you have to use 4 pistons? If you are, we have the instant & direct fitting answer, mini-6 Calipers require no brackets and you can use the standard Disc rotors. Also available for VFR750s, CBR600s etc. 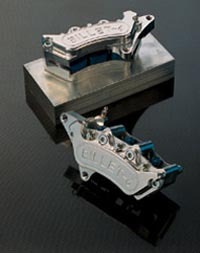 for much less than the cost of original Calipers, better looking and much more effective too. We can also offer you an upgrade to your radial stock calipers with our 800 SERIES radial mounted calipers for your CBR's. Let's not forget our 2 Piston caliper and bracket for your rear end.